Hudson Valley Gives, a local day of online philanthropy, is coming up on Wednesday, May 15, 2019, and it’s your chance to connect with a non-profit providing services in your own backyard. Donate at HVCS’ special page on HVGives.org and we’ll potentially unlock some great incentives, matching funds and set new local donation records! 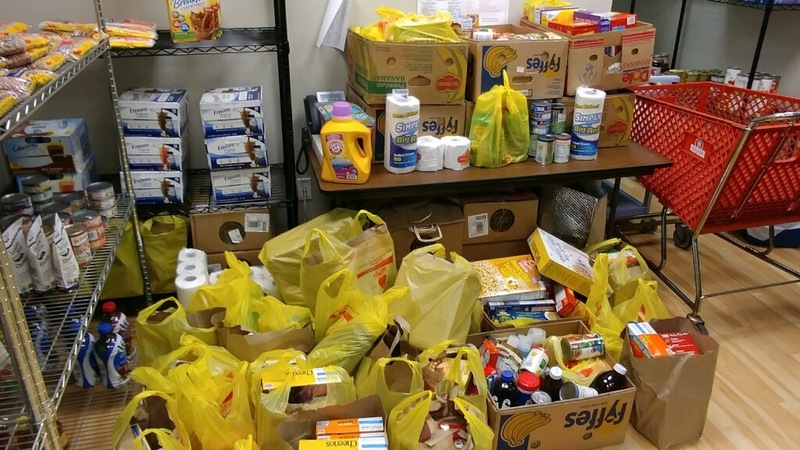 If you make a $25 donation, you supply a client and their family with food for three days. Make a $35 donation, and you put socks on the feet of 18 homeless clients. Make a $50 donation and you help three low-income people know their HIV status by covering the cost of HIV testing. With a $75 donation, you help us provide Narcan kits, life-saving overdose reversal medication, to those at high risk for overdose (and/or their family members and friends). Mark your calendar and get ready to donate on May 15th–and join thousands of others in making the Hudson Valley an even better place to live healthfully and thrive! Hudson Valley Community Services has been awarded a grant for $22,000 from The Elizabeth Taylor AIDS Foundation (ETAF) in partnership with Macy’s. 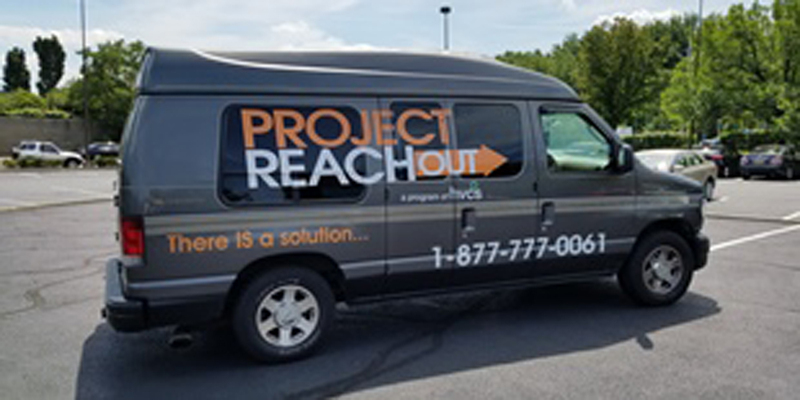 The grant will be used for HVCS’ Psychosocial Support Services (PSS) program, which is a unique vehicle to provide HIV-positive residents of Westchester, Putnam and Rockland with emotional and psychological support, support groups, and ensure they remain connected to care and community. Specifically, ETAF’s grant will fund art therapy and interactive journaling for the women’s support group. PSS began on March 1, 2019. Through their Cause Marketing Program, Thanks For Sharing, Macy’s recognizes their responsibility to support disadvantaged communities and the needs of their neighbors. They are proud to partner with ETAF and have contributed to this grant. The Psychosocial Support Services program’s main funder is the Ryan White CARE Act, Part A, administered by Public Health Solutions. Founded in 1991, The Elizabeth Taylor AIDS Foundation (ETAF) joins Elizabeth’s voice in the fight for social justice and human rights for people living with HIV and AIDS to achieve an AIDS-free world. Inspired by Elizabeth’s personal passion for the cause, in 2019 ETAF is focused on youth, women, children and families, ensuring they receive the direct care and support they need both domestically and in Malawi, the hotspot of the global epidemic. ETAF’s advocacy and awareness initiatives concentrate on elevating Elizabeth’s voice to secure care for the marginalized and social equity for all. To learn more or to make a donation please visit www.etaf.org. Got questions about the latest ways to reduce your risk for HIV, STDs and hepatitis C? So do lots of our followers. Members of our Education & Prevention Department went live on Facebook to answer them. In this video, we covered PrEP, PEP, how risky certain sexual behaviors are (or not), and how to reach our programs for more services! Need free testing services? Contact us at (845) 704-7624 — you can call OR text! ? You can also email us to set up an appointment. Hudson Valley Community Services provides a range of services for people living with chronic illnesses–including case management. But what is case management? We say that phrase all the time in the social services field, but what does that mean? Rather than try to define it, HVCS’ LaShonda Cyrus (who was promoted to Assistant Director of Client Services right after this video was made) shares an example of what it takes to connect people in need with the services that help them live their best life. This video was animated and produced by Darell Green, a student at Dutchess Community College, as part of their Service Learning Program under the advisement of Prof. Holly McCabe. Have you heard of the HIV Care Cascade? Essentially, the HIV Care Cascade is a way we can measure the effectiveness of HIV treatment among HIV-positive people. The Cascade uses viral suppression as a measurement–and viral suppression is the medical state in which the number of copies of HIV in a person’s blood is so small that it can’t be detected by the best tests we have. If someone is virally suppressed, they can’t infect anyone else with HIV, so it’s good for them and their sexual partners! The Cascade is an analysis of the steps or stages of HIV medical care that people living with HIV go through from initial diagnosis to achieving viral suppression. The metrics were developed by New York State’s “End the Epidemic” (ETE) Task Force to track and report to the public the state’s progress on the initiative. 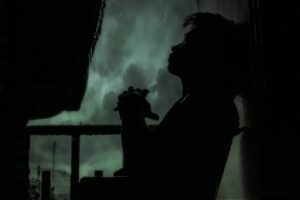 There are four key metrics in the Cascade, including: the number of individuals who are diagnosed with HIV; the number who have evidence of medical care during the year; the number who are retained in care (visiting a doctor more than once per year), and the number who are virally suppressed. So, how are we doing? Since you can apply the HIV Care Cascade to different groups, let’s look at New York State as a whole and HVCS clients. the overall state average of viral suppression is 72% of HIV-positive clients who received at least one viral load test in 2017. But HVCS clients are beating the average. We recently compiled our own HIV Cascade for the first time, using 2017 data from some (not all) of our programs. 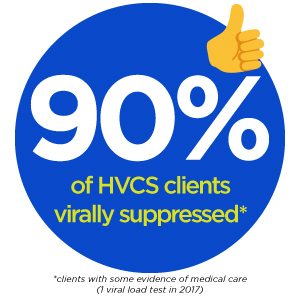 90% of HVCS clients with evidence of some medical care (they received at least one viral load test in 2017) are virally suppressed! We work as hard as we can to assist our clients with accessing and staying connected to medical care to keep them–and the whole Hudson Valley–as healthy as possible. Sandy*, one of our clients in the Mid-Hudson region, is like a lot of people in her thirties: she was working several jobs to make ends meet, had no time to eat properly or exercise, had a few minor health problems that she ignored. She was definitely not focused on her health. That is, until she became HIV-positive. She didn’t want to see a doctor about it, and was not on HIV medications at all. Our Health Home care manager Maria knew that Sandy needed a lot of emotional support and encouragement to start HIV treatment—and she also knew that Sandy’s health was in great danger if she continued to ignore her HIV-positive status. “I don’t have time for that. I’m too tired,” Sandy would say. Maria was extremely patient with Sandy and, after months of building trust, she eventually got Sandy to see that her health mattered. Sandy finally went to see an HIV specialist and got on treatment. Thanks to her doctor and Maria, Sandy is now virally suppressed—with no detectable HIV in her blood—and is now connected to a whole host of health resources. Maria reports that Sandy is doing very well. When someone comes to a standard emergency room because of an opioid overdose, the staff do everything they can to revive them–but what happens after that? At St. Luke’s Cornwall Hospital (SLCH) in Newburgh, they provide overdose patients with a short-term prescription for buprenorphine, a pharmaceutical which prevents withdrawl symptoms without providing a high. This short course of buprenorphine is known as induction and it’s the first step in assisting the client to discontinue or markedly diminish their use of other opioids. SLCH can only offer the induction phase, not a longer-term prescription program, though. That’s where our Health Hub comes in. We recently began a collaboration with SLCH in which we transition clients from the induction phase to long-term bupe use (known as a Medication Assisted Treatment Program or MAT). 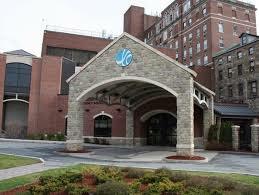 Hospital staff and clients appreciate that HVCS’ services are low-threshold. Clients who come to the Health Hub are able to receive Buprenorphine treatment with out the fear of being discharged because they either relapse or are using another substance. We expect for this collaboration to be very successful and are looking forward to work closely with other hospitals as they begin to look at the same model as St Luke’s Cornwall Hospital. 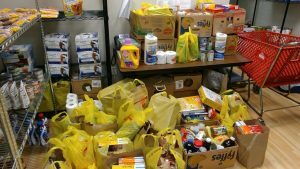 There is some important news for clients of our Nutrition Outreach and Education Program (NOEP).